When you hear that you are expecting a grandchild, your joy is bolstered by the realization that, unlike when you had your first child, you know what you are doing this time around. Only maybe you don’t. Many of the things you did when your kids were babies are now considered unsafe or unnecessary. Sleeping position. You probably put your children to sleep on their tummies. But now experts say babies should sleep on their backs, and they use the term “Back to Sleep” to help parents – and grandparents – remember. Pediatricians believe that back sleeping reduces the risk of “crib death,” or Sudden Infant Death Syndrome, that tragic and unexplained death of a baby in his crib. And the statistics back them up: SIDS has fallen since parents were advised to put their babies to sleep on their backs. It is especially important that everyone puts the baby to sleep on his back. A baby who is accustomed to back sleeping and is put to bed on his stomach is 18 times more likely to die of SIDS, according to the American Academy of Pediatrics. Cribs and bedding. The crib your children slept in almost certainly would no longer be considered safe. New cribs have the slats closer together, and they cannot have a drop side; in both cases, this is to keep babies from getting their bodies caught. And the mattress should fit tight in the crib, so that the baby cannot slip between the mattress and the crib and suffocate. If you are shopping for a crib, look for one certified safe by the Juvenile Products Manufacturers Association. In addition, experts say cribs should not have bumpers, and babies should not be covered with blankets or be put to bed in cribs that contain blankets or toys. That’s because of the danger that a blanket or toy will cover the baby’s nose and mouth while he sleeps, suffocating him. 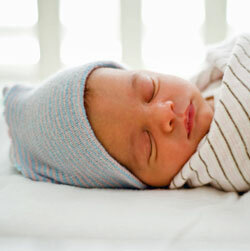 Instead of blankets, pediatricians recommend that babies wear sleep sacks if their room is cold. Tummy time. One disadvantage of back sleeping is that babies get little time on their stomachs, and therefore little chance to practice lifting their heads and developing their neck and arm muscles. As a result, pediatricians recommend that every baby have some “tummy time” every day while the baby is awake. Put the baby on a mat or blanket on the floor, and encourage him to lift up his head and look around. It might help to provide toys such as baby mirrors to give him something to look at. Car seats. You know babies should not ride in a car without being in a car seat. But the American Academy of Pediatrics says that all children should ride in a rear-facing car seat in the back seat until they are 2 years old or exceed the height and weight limits of the seat. Children over 2 can move into a front-facing car seat until they reach the height and weight limits of that seat. Then they should sit in a booster seat until the vehicle’s seat belt fits properly, which is usually when they are about 4 feet, 9 inches tall. They should remain in the back seat, however. In fact, the American Academy of Pediatrics says that all children should ride in the back seat until they are 13 years old. And children should never ride in a car without being properly belted in.